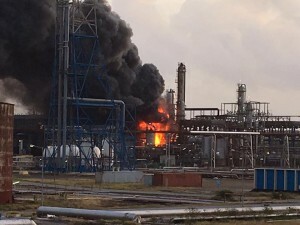 WILLEMSTAD - The installation of the Isla which was completely destroyed by fire in May this year, the Crude Distiller 3, as it is called, will be restarted tomorrow. Then follow other parts of the cat cracker where crude oil is converted into short hydrocarbon compounds. The refinery thinks that the whole process will take two weeks before everything runs as it should. The startup is usually accompanied by black smoke coming out of the chimneys.